Been reading a post between the medic and cfengineer. I have the same issue. In its place a switch for ignition and a momentary switch for start. Been working this way for years. Haven't seen a CJ on here in forever! Let me digest this a little. Have you had that ignition module tested at the parts store? I learned long ago, new ones can be bad too! If you get a new one, test it before you leave, do the test 5-8 times in a row! Have you had the distributor out? Is this a new buddy for you? Has it ran for you? Yes had it tested. Yes distributor is new. Removed old one after marking orientation of advance pot and rotor. Yes its new to me been running for me for 6 mos. Ran for previous owner 4 years. I read one of your previous posts and did what you said there are several of your questions answered in my first post. I am glad it was you that found it. If it coughs into action, removing the wire should kill it. WATCH OUT FOR THEM PESKY MOVING PARTS! If things are scarce, you can chop up a cheap 6 foot household extension cord to do it. Been working on "Willys" steering gear all night, getting the slop out, midnight-thirty here, must work tomorrow! Nothing with wire between battery positive and coil positive. My hypothesis at this point is Something is not hooked right or is grounding out when you turn it 'ON' ('I' might be fine, but the other end is cancelling it out. I'll sling this out - You have the Ignition Module is grounded well? This is not the original engine is it? Yeah, it's from the 258, I want you to see if all of the wires (not the firewall) go where they should, are any missing? Do any hook to something not shown in the diagram? Can you send pics of tour engine, top, sides? I'm here for the long haul, try to bear with me! I'll keep going as long as you will! Ok. Lets go through this again. One spark from coil to ground when released. Can I get you on the phone while I test? I'll PM you after another check or two. Mr. Distributor has been out/ partially out of his hole during this sickness? This may be a review, dumb stuff does happen! Lemme know how this goes! Some good pics of/ around the engine might help. We will get you going! Yes as I said I replaced the distributor. I clocked the rotor and the advance pot before removal and reinstalled in the ecact same positions so the timing is close to correct. I listed everything I have done or confirmed in the previous post. I have traved all the wires now and drawn you a diagram. There are other pics too. 9. 2 oranges and a purple through passenger side firewall. I know you think I'm not hearin' what you have done! Doing this online is more of a challenge, even in person sometimes this'll blow one's mind. The modifications to one throws a twist in the whole deal. How about doing the TDC thing (# 1 plug screwed in a turn or so) listen for hiss while turning with a ratchet. Continue around till the timing marks are on "0". AS said better in the LINK I SENT! Verify that the rotor button is pointing at #1 spark plug wire. IF this ain't right, you will still get spark, just at the wrong time! 10 minutes now may save you a lot more time later! We have to methodically eliminate factors. Any clue whats under the dash on the passenger side.? Too dark for pics now. Stand by. Agter resding many of your posts I cant figure why I have no spark while cranking.? I have 11v at the coil. I understand that if the timings out it won't run but it would backfire and carry on.? Its also odd that I get a spark when depressing the start button and when releasing it. What is that black thing in line on the green wire. I have been trying to do this systematically based on other if your posts. Do you have a procedure to follow step1 through step? I only get to work on it in spurts so it is difficult to do this one post at a time. Wow. The pick up is good. Thanks. I've spent a good while making this for you. That's why I have not responded. Lemme know if this helps, I found the basic diagram on the net, you'll see my erasing and adding of the wires and explanations. Post any un-sure-ities! Alternator thing is new on me! Maybe a condenser for the radio? Fusible link? Does the juice flow thru it? I reckon I cut the bottom off. IGN MODULE "WHITE WIRE" came down, then over the module, then to the bottom, ran left, then up the left side and tied into the "S" wire (BLUE- you can see that end of the white wire) These two wires connected at the firewall (look at one of my 1st diagrams from way up above). 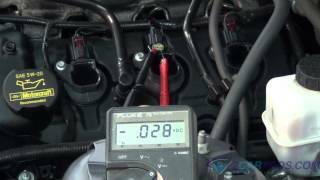 News on TDC and rotor position at distributor cap test? No tdc till tomorrow. Ill look at the white wire them too. Btw. Thats not my distributor. Cap is one piece on mine. If you look at the pic of my module connector youll see it had no purple but it does have purple on the module. The purple wire connected to the distributor is coming thru the firewall on the passenger side. Thats what makes me ask whats back there. Thanks for the help. More tomorrow. The 258 and 304 share the same diagram. 304 being in the upper left corner and 258 is directly below it. You will see the Battery for both. East and West and South of the 2nd battery is mostly the 258. Sorta disregard the stuff pertaining to the 258 (it is so close to the 304 wiring). I feel sure the 1984 Ghost wire goes into the firewall/ thru the computer/ back out. Need to eliminate the ghost stuff and insure the wires go directly from one part to the other with no 'goodies' in-between. Pic 3, I also had the 2 pieces of my home-colored diagram blown up at Office Max. I overlapped them correctly, taped them in place, then Office Max laminated it for me. It's darn big/ EZ to trace wires/ fast to find stuff. I have no idea why the 1st pic did not show above, it was loaded. 2nd pic is the main one anyway!